We make fresh cheese curd EVERY Thursday year round! It is usually ready by 5pm! We also offer grass-fed ground beef and stew meat at the house and the farm! Please call for steaks, roasts or briskets. Welcome to Bechaz Dairy/Bechaz Riverdale Cheese! We are a 4th generation dairy farm that produces fresh, homemade, artisan cheese curd from our 70 holstein/jersey milking herd. Our only ingredients are fresh whole milk pumped right from the herd into the cheese vat, natural cultures and a little bit of salt. We also offer flavored curds such as Garlic/Chive, Ay Chihuahua Chipotle, Mustard Dill, Onion Pepper and various flavors of the month! We are now making several brick cheeses! We have a Swedish Bondost which is a semi-soft aged farmer's cheese with fennel flavoring! One of our unique additions is our "wine cheese"! We are making a brick cheese which is aged in a wine brine. 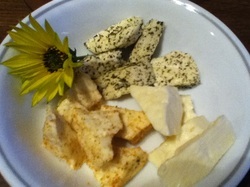 We currently have cheeses made with Razzle Dazzle from Coyote Moon Winery and St. Lawrence Red from TI Winery. We also offer a mildly aged cheese which is a hard pressed cheese with a smooth, delicious flavor! In addition to our Swedish Bondost (a semi-soft aged farmer's cheese with fennel flavoring!) we make a Garlic/Dill brick cheese and a peppercorn brick. We are proud to offer our cheese fresh from the 1000 Islands in Clayton, NY, where you can see our herd grazing in the pastures overlooking the majestic St. Lawrence River! Our milking herd is grass fed and rBST Free! We do NOT use any artificial growth hormones with our dairy herd! We now offer grass-fed beef. Ground beef is available for purchase in the freezer. Please contact us to inquire about steaks and roasts. WHERE ELSE CAN WE BE FOUND? ALWAYS LOOK FOR THE COW, LIGHTHOUSE AND THE BRIDGE!!! Producing cheese every Thursday- just in time for your weekend festivities! Stop in to the cheese room or up at the house to purchase our curds. In the Clayton area... The Victorian, Clayton Shur Fine... From Fisher's Landing to ABay - The Gal's, TI Winery, and Valero ABay! Heading inland...North Country Store in Philadelphia, Anthony's General Store on Bradley Street, and the Dexter Market. Many fine restaurants in the area also carry our cheese for their fried cheese curd, poutine, cheese platters and other fine dishes. Please ask for us at Coyote Moon Downtown and the Harbor Hotel in Clayton. In Chaumont, you can enjoy our cheese curd at the Crescent Restaurant! In Alexandria Bay, check out our cheese at Fin's! In Cape Vincent, taste the new creations at the Coal Dock Restaurant! The newest restaurant to pick up our cheese curd for their poutine is Longway's Diner on Route 342! Thank you to our summer businesses and customers at The Channelside, Cavallario's Dock of ABay, Tin Pan Galley, Captain Jack's, Bella's, Tricia's Rondette, The Clipper Inn, Dark Island Spirits, Wimpy's in Three Mile Bay, Cedar Point Market, Cape Riverside Market, and the CWAY Restaurant for a wonderful 2018 Summer Season! We look forward to seeing you all in the spring! Have a safe and happy winter!!! AND, of course, we are ALWAYS open at the house and the farm! Don't forget to also pick up our grass-fed ground beef for those delicious winter soups and stews or just a YUMMY burger night!